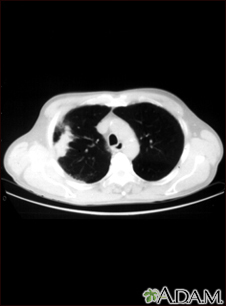 This CT scan shows a cross section of the lungs of a person with lung cancer. The two dark areas in the middle of the screen are the lungs. The light areas in the right lung (on the left of the screen) represent the cancer.